From taking an idea, to making a mould and then making the final fibreglass product, we are here to make it happen for you. Slides are one of the all time favorites for children’s playgrounds and our slides are made in 3 popular sizes for your cubby house or fort. The sizing depends on the platform height. Our 2.5m slides are recommended for a 1.2m platform height, our 3.2m slides are recommended for a 1.5m platform height and our 3.6m slides are recommended for a 1.8m platform height. We can also make a 4.9m slide which we recommend for a 2.4m platform height for those that want a very large slide. Our slides have slight waves and are not just straight down, with the 2.5m slides having one wave and the 3.2m and 3.6m slides having two waves. The Fibreglass Shed makes a wide variety of ponds, finished in either black, brown or cream gel coat or in a pebble mix finish. We can even make them to your specific dimensions. Call us to give you a quote. Our truck bubbles range consists of seven sizes ranging from 6ft x 2ft to 8ft x 5ft. We also make light recesses, camera inserts, side fairings and door blanks. With Tim being a boating man himself, The Fibreglass Shed is able to offer a wide range of boat repair work. From transoms to floors, bring your boat in for Tim to have a look at and give you a quote. We can custom make tanks to size for things such as storage, chemicals or cooling. The Fibreglass Shed is able to produce one-off products for special events. An example of work we have done is the lotus petals made for Mothers Art to form the giant 5m lotus flower in the Chinese Precinct in Bendigo. 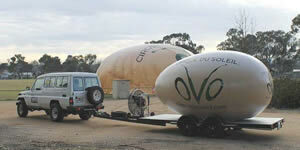 Another is the giant egg trailer made for Crawford Containers for the Cirque Du Soleil OVO balloon.